I used YSL Gris Deco for my base. It's lighter than my actual sweater, but I wanted to use it anyway. It's my first YSL polish, and my first time using it. I was not disappointed. Three coats for full opacity and a very nice formula. It was purchsed by me from Sephora.com. The circle glitters are from bornprettystore.com and previously reviewed. I love them! They are easy to work with and fun to use. A last look at my inspiration! Obviously I need to know who makes that sweater! I love these nails! love this! what a great way to do stripes! This is lovely; thanks for sharing! So clever. <3 I love this look. Definitely a good buy. The mani is fabulous too! can we get a pic of you wearing the sweater? i am loving the fashion week of the digit-al dozen. You have the patience of a saint. Everything is perfecting lined up! 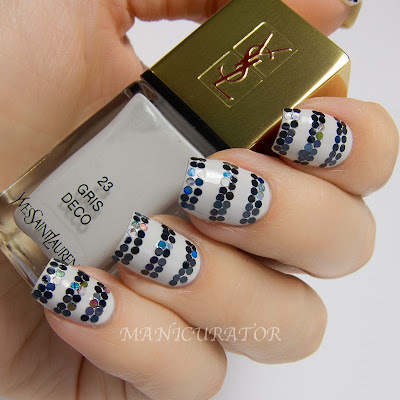 Both the sweater and nail art are gorgeous!